Friday 21 Jan, Mount Smart Stadium, Auckland. I’m proud to say this was my fifth Big Day Out, and despite the torrential downpour, it was one of my favourite years. Especially since I’ve made rookie mistakes other times such as not drinking enough water or drinking too much, causing me to be stuck in a mosh pit with the unbearable urge to pee. Any who, here are the top picks from someone who spent literally nine hours in front of the orange and blue stages. After waiting two hours for my moment of glory, where I met Deftones (very friendly bunch), I headed over to the orange stage. Admittedly, I’m not really acquainted with this band or their music, but the audience were enjoying themselves and singing along word for word. Their sound was definitely reasonable from where I was standing, and even though I’m not a huge fan, they did a good job of holding down their spot on the main stage. This is another band I’m not really into because I think they do a little more than just pay tribute to AC/DC. You could say I think they are musically more suited to the pub than the stadium. But in terms of performance, they were definitely entertainers. From synchronised head-banging, throwing cans of Tui into the crowd and drinking cheap wine, these guys did all the right stuff. 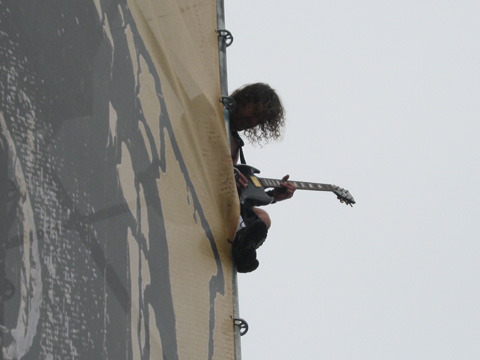 Mine and possibly everyone else’s favourite moment was lead guitarist Joel O’Keefe climbing dangerously high on nearby scaffolding to perform a solo as paramedics looked worried underneath. While Airbourne were playing I could see the Deftones sound technician ripping his hair out trying to set things up. The main problem for them, and later for Iggy and the Stooges, was they couldn’t hear properly, which meant it was very hard to tune their sound. 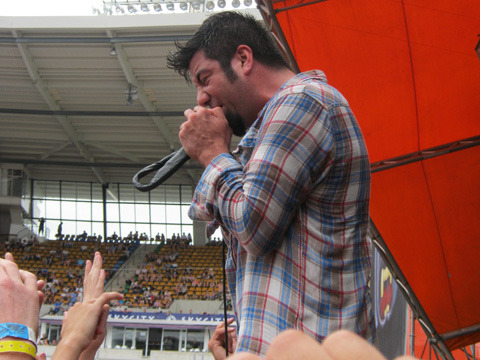 Chino’s vocals on the opening track were a bit off, causing him to shrug exasperatedly at the technicians and perform a masturbatory gesture with his microphone. However, despite my worst fears, this problem was soon fixed. 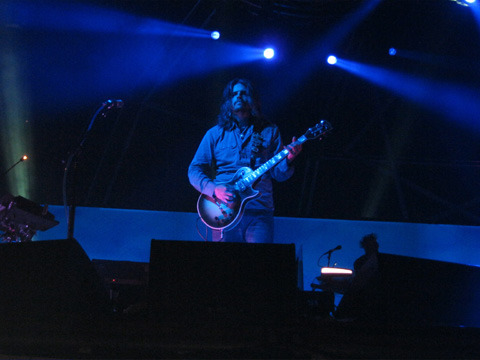 They didn’t play their White Pony classics and unsurprisingly, Tool vocalist Maynard James Keenan didn’t come out for a surprise rendition of The Passenger. But there were still plenty of great tracks thanks to Minerva, Be Quiet and Drive, Rocket Skates and an acoustic performance of Sextape. Chino hit all the right notes and new bassist Sergio Vega seemed to be truly enjoying himself with his crazy facial expressions and constant grin. Sadly an hour slot meant it was all over too quickly. Rating: 4/5. I shed a tear. 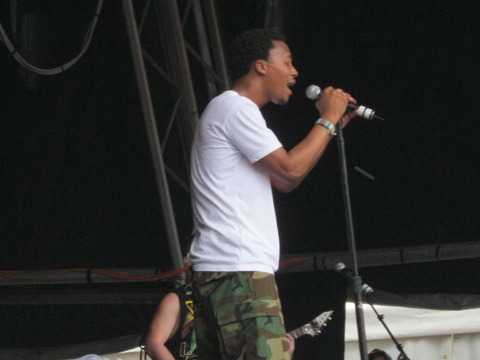 Firstly, I am a huge Lupe fan. I went to BDO in 2009 just to see him perform and meeting him is still one of my favourite musical memories. But as much as I love Lupe, this performance wasn’t great. After the show began with two false starts caused by sound problems, he performed a mixture of new songs like Beautiful Lasers and fan favourites Kick Push. Usually when an MC premiers a new song live the crowd goes insane, but Lupe played about five tracks from the album which seemed a few too many. The set list was also lacklustre, the crowd would be pumping and seconds later there would be a new track no one knew whether to dance or sway to. However, he did do a great job of playing hip-hop to an audience who had just seen Deftones and Airbourne. Lupe later told the audience he had to wait a few seconds because his next song Go Go Gadget Flow was physically tiring, fair enough, but I vividly remember him launching right into the song last time. Hearing an artist tell you to wait before he does a high energy track just seems strange. The show also featured a very average guitar solo which caused my bogan friend to look at me in disdain, and embarrassingly I had to agree, it was weak and unnecessary. Mr Fiasco later apologised for any sound issues and said it was because it was the first show their Steppin Lasers tour. I also think he would have been better suited to the Boiler Room. He seemed to agree when he told TV3 he was annoyed he wasn’t playing there. I had no idea what to expect for this one, but I was pleasantly surprised. Iggy took several trips down the front row and sounded great on Raw Power and I Wanna Be Your Dog. He was definitely his unpredictable self with the usual crazy rambling and dancing. Returned guitarist James Williamson was obviously still trying to get to grips with his instrument, but the whole band played their guts out. 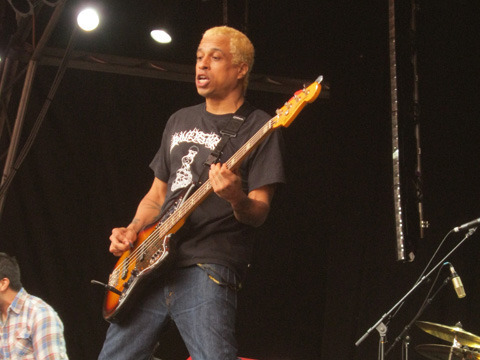 Iggy later invited fans to come up on the stage and join the band. I could see for some people who were hugging band members and dancing with Iggy, it was a truly amazing experience. My feet were numb, I was damp and my ribs were being crushed by the crowd, but I loved this band and it’s a sin their set was only 50 minutes. Relative newcomers Nicky Bomba and Byron Luiters filled the shoes of Butler’s former band mates perfectly. Everyone was having a good time, with Butler and Luiters throwing a banana at one another while still managing to play and later, all three musicians having a go on Bomba’s drum set. 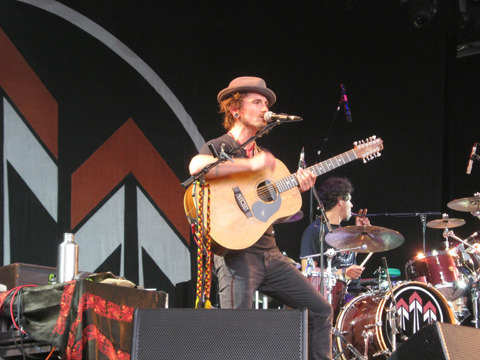 Finally, John Butler’s live rendition of the instrumental Ocean was seriously moving. One of the best live performances I’ve ever seen. Look it up. I couldn’t see Rammstein that clearly from where I was standing. But they sounded fantastic and their special effects were top-notch. The band barely spoke to the audience, which is often a bad thing but in this case it just added to their mystique. Amazing show and I’m not usually a fan. With the most albums sold per person worldwide, New Zealand is big on Tool, and I’m not afraid to admit, I’m no different. I know some people don’t like them or their fans, because of the sense of elitism that comes with the music and I can fully understand that opinion, but you have to admit these guys are excellent musicians with a unique sound. Their show was slightly toned down from 2007s Big Day Out performance, which featured surprise vocals from Serj Tankian on Sober. However, it was still a masterpiece. Yes, I used the word masterpiece. Third Eye and The Patient were surprise additions to a set list which also included Lateralus, Stinkfist, Schism and Vicarious. The crowd were singing songs word for word and Tool’s visual show was impressive as always. I read a few reviews which said vocalist Maynard James Keenan messed up the words to Aenima, but I couldn’t tell. He’s a weird guy, he didn’t say a lot, and it ended as abruptly as it started, but that all adds to the mystery of Tool. All three remaining members waved to the crowd after the show with Danny Carey throwing pieces of his drum kit into the audience and Adam Jones teasing us with his whole guitar. As I gingerly walked away from Big Day Out soaking wet and stuffed, I knew the nine hour wait was worth it.